Ciarra Mendoza is wanted by the San Diego Fugitive Task Force for an outstanding probation violation (no bail) related to a conviction for possession of narcotics for sales and has an outstanding felony warrant ($175,000 bail) for robbery. Mendoza has past convictions for possession of narcotics for sales, robbery, and auto theft. Mendoza is known to frequent the El Cajon area, but may be anywhere in San Diego County. San Diego County Crime Stoppers along with investigators from the San Diego County Sheriff’s Department’s Poway Station are asking for the public’s help in identifying and locating an unknown suspect wanted for a commercial armed robbery at a Walmart located in Poway. On Saturday, November 10, 2018 at approximately 8:00 p.m., an unknown Black male approached the Customer Service counter at the Walmart, located at 13425 Community Road in Poway. 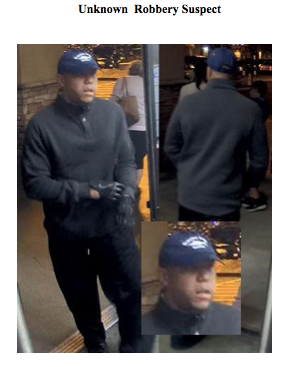 The man displayed a semi-automatic silver and black pistol in his waistband and demanded that the employee open the cash register. The Black male suspect removed the entire cash drawer and fled the area on foot with an undisclosed amount of money. The suspect is described as a Black male between 30 to 40-years-old, standing 5’10” – 6’0” tall, unshaven, and with a medium complexion. He was last seen wearing a blue baseball-style cap with white lettering and an image of a marlin fish on the front. It may be advertising for a charter fishing vessel. He also had on a black or dark blue long sleeve shirt, black pants, black shoes, and black Nike gloves. Anyone with information on the identity or location of the suspect is asked to call the Poway Sheriff’s Station at (858) 513-2800 or theCrime Stoppers anonymous tip line at (888) 580-8477. CrimeStoppers is offering up to a $1,000 reward to anyone with information that leads to an arrest in this case. Visit the Crime Stoppers website atwww.sdcrimestoppers.orgfor more information on how to send anonymous web and mobile app tips. Media inquiries about this case can be directed to Detective M. Lozano, (858) 513-2848, mlozansh@sdsheriff.orgor FBI Special Agent I. Pennington (858) 320-1800. Media inquiries about Crime Stoppers can be directed toDeputy Adriana Uribe at (619) 531-1547 or email at adriana.uribe@sdsheriff.orgor Officer Mark Herring at (619) 531-1500 or email at msherring@pd.sandiego.gov. San Diego County Crime Stoppers and investigators from the San Diego Police Department’s Western Division are asking for assistance from the public to help identify and locate the suspect(s) responsible for burglarizing a hotel room in the Mission Valley area of San Diego. On August 8, 2018, between 8:00 p.m. and 10:00 p.m., an unknown suspect(s) forced entry into a guest’s room at the Town and Country Hotel located at 500 Hotel Circle North, in San Diego. The room was unoccupied at the time of the burglary. The suspect(s) stole several items including a rare custom made cello. The cello is made by Mario Miralles and has a label on it that reads: “Mario Miralles 2010 Alta Dena California”. The cello is valued at $100,000. • Media inquiries about this case can be directed to Sgt. Ken Impellizeri at (619) 692-4853 or email at kimpellizeri@pd.sandiego.gov . • Media inquiries about Crime Stoppers can be directed to Officer Mark Herring at (619) 531-1500 or email at msherring@pd.sandiego.gov or Deputy Adriana Uribe at (619) 531-1547 or email at adriana.uribe@sdsheriff.org .